"It should be easy to find a Tulip in Paris." 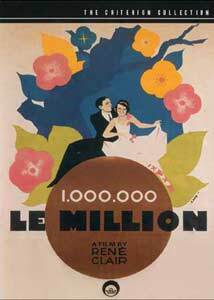 When sound came to motion pictures in 1927, avant-garde director Rene Clair prophesied the deathof film. He proved himself wrong with his amusing musical comedy, Le Million, whichmakes extravagant use of sound and song to underline the action and to comment upon it. Impoverished artist Michel (Rene Lefevre) is being harassed by his creditors while he attempts tomake love to his model, Vanda (Vanda Greville). Discovered by his fiancée Beatrice (Annabella),a ballet dancer, Michel tries to patch things up with her but is distracted when the creditors show upagain. At the same time, a master thief, Grandpa Tulip (Paul Ollivier) ducks into Beatrice'sapartment and helps himself to Michel's jacket. When Michel learns that he has bought the winningticket in the Dutch lottery, he is chagrined to find that the ticket is in the coat which has nowwandered away. The rest of the film concerns the attempts of Michel, his roommate Prosper (LouisAllibert), Vanda and Beatrice to recover the coat in a wild romp that finds Michel behind bars and onstage at the Lyric Opera. In this prototype for the Hollywood musical, Clair is nearly arrogant in his insertion of songs into theaction. In addition to the Greek chorus of creditors who comment on Michel's fortunes andmisfortunes, there are also several voiceovers in which Michel and Prosper sing to themselves. Aduet onstage at the opera plays out over the wordless exchanges between Michel and Beatrice on thescreen, giving an interior view of the characters through pantomime to the lyrics of the song. In theclimactic tussle over the jacket at the opera, Clair boldly uses the sounds from a football game,complete with cheering crowds. Lefevre makes an appealing and sympathetic protagonist; his small size lends him a Mickey Mouse/everyman quality that makes his plight seem even more a trick of fate. Beatrice is a fairly standardfemale lead, but Vanda Greville really is notable as the scheming golddigger. Louis Allibert makesa fine amoral Prosper. The irritating tenor who ends up with the jacket, Sopranelli, is beautifullysketched in a brief exchange where it is established that he hires young women to throw him bouquetsafter his songs. The film has an almost Magic Realism feeling to it; we're firmly planted in the real world but thereare touches of the bizarre as well. The opening sequence, on the Paris rooftops, prefigures the unrealrooftop world of Mary Poppins, and the mass of leaves which falls upon the romancingcouple backstage at the opera give us a distorted sense of reality that is highly intriguing. Image Transfer Review: The image is sharp and gorgeous, with plenty of deep blacks and a wide range of greys. Someinstability in light levels and flickering is visible throughout, but this is a problem with the sourcematerial. There is light speckling near reel changes, but in all a very pleasant presentation indeed. Audio Transfer Review: The French mono suffers from noise and hiss typical for pictures of this period. Dialogue is generallyclear, however, and the music is agreeable although somewhat tinny and limited in range. Theopening sequence begins quite crackly, but quickly calms down after a few moments. The sound oftolling bells is a bit warbly, indicating some kind of problem with the running speed. This is certainlynot reference material, but about as good as one is likely to find in a picture of this vintage. Extras Review: A 09m:13s clip of Clair in a television interview, discussing the use of sound in film, with specificreference to Le Million, is included. Taken from an old kinescope, this interview is insurprisingly good condition. 19 stills from the film are included in a short gallery, and the ubiquitousSMPTE color bars are here. Finally there are brief but useful production notes contained in the insertbooklet. Despite the claims of the packaging, not all of the songs are subtitled; the opening song forsome reason is not provided with subtitles. An engaging and influential screwball comedy given a beautiful transfer; unfortunately the sound hasnot aged well at all. Recommended for those looking for something a little different.